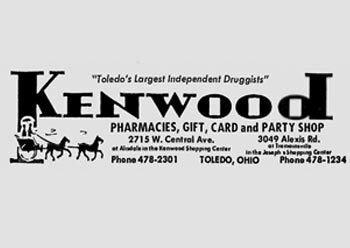 A kid growing up in the Toledo’s Old Orchard neighborhood – and probably a wider area – in the 60s and 70s could find no better place in the world than Kenwood Pharmacy. There are no doubt a lot of adults who remember it too, almost 25 years after it closed. The Ace Drugs down on Bancroft by the University of Toledo couldn’t touch it (I know this because I always got my haircut next door at Campus Barbers). When I moved from the neighborhood, I still came back to Kenwood, since Kenwood had it all. It was at Central and Alisdale in the Kenwood Shopping Center, the shopping center with a Food Town, an A&P (at one time, anyway), and the Sanger branch library. There was another Kenwood up on Alexis Road, but I never set foot in there. I dropped a lot of my allowance at Kenwood. It was a short walk/bike ride from my house, and everything a kid under 10 needed, they had. Candy. Mad Magazines. Wacky Packages. Newspapers and (more importantly) Racing Forms. Kenwood Pharmacy got the first video game I ever saw: Pong!. There was a lunch counter along the east wall for the longest time. I never ate there, but it was apparent a lot of the old Jewish people living in Kenwood Gardens did. It was part meeting place, part grocery, part local hangout. In 1947 she and her husband opened Schwartz Drugs at Fulton and Delaware. Starting in the 1950s she started and operated gift shops in the three branches of Kenwood Pharmacy that they owned. Mildred and Max Schwartz were well known to many customers who frequented the popular store at Central and Alisdale in West Toledo. Kenwood Pharmacy disappeared in the early 1980s when the stores were sold to Rite-Aid. It was a Rite-Aid for a while, and while there is a Powerhouse Gym at 2715 W. Central these days, the whole shopping center is an echo from the past anyway. The Schwartzes retired to Florida. Max died in 1994. Oh my gosh! A game of chance! Kenwood eventually did get its license; I can remember a Miller High Life sign in the front window. This ad from November 26, 1970 not only shows Max and Miss Mildred, but the front of the store in blurry black-and-white. I’d kill for an actual picture. Kenwood Pharmacy is the kind of place I wish were still open so I could go back there and step back in time, however briefly. This is from Max’s son, Norman Schwartz. I’d like to know who wrote the article above and maybe be in touch to tell some ” Kenwood ” stories. I worked there many years through school and all. I left the business in 1968 and moved to Cleveland with Levi Strauss & Co. I’ve been in Miami, Fl. since 1978. I have a lot of good memories of that place. It was a natural destination for a kid on a bike. I remember my dad taking me to the lunch counter there for a hot chocolate after sledding at Ottawa Park and that my allowance was not quite enough to cover the 55 cents that a Matchbox car cost. I also remember going with a bunch of neighborhood kids to the Sanger library in the same plaza on very, very hot days, and suffering through the boring story hour, just because it was the only place in the neighborhood that was air conditioned. 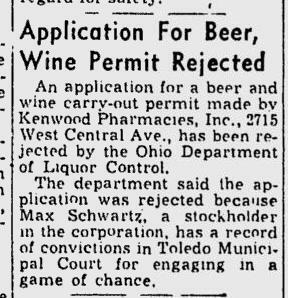 I am an old Toledo boy who enjoyed the pleasure of knowing both Schwartz Drugs and Kenwood Pharmacy. GREAT MEMORIES. I lived in the old west end and went to the old fulton school across from Schwartz drugs. My dad would send me to “Max’s” to buy cigars. They knew me and would sell the cigars to a kid. They had a gumball machine with a special colored gumball called a “WINNER”. If your penny got one then it was worth 5 cents and you could trade for ice cream cone. Gambling! Would also find pop bottles in alleys and cash them in at store for candy. They also had a great soda fountain that Kenwood Pharmacy would assume the tradition. When I moved to Old Orchard in the early sixties I would ride my bike over to Kenwood Pharmacy and hang out. There was great magazine rack with comic books and paper back books. The gift store had neat stuff you couldn’t find anywhere else..novelties and things. The soda fountain was great if you could find a seat and you could get a great burger with milk shake you couldn’t finish. I lived in the Old West End and went to the old Fulton School across from Schwartz Drugs. My Dad would send me to “Max’s” to buy cigars. They knew us well and would sell cigars to a kid. The store was the classic old neighborhood drug store. It had a soda fountain and you could get a drink or ice cream cone for 10 cents. There was a gumball machine that had special orange/yellow “winners” that if you got one it could be traded for 5 cents enough for a candy bar. I would also scavange pop bottles and get the deposit as Max’s to buy candy, etc. Kenwood Pharmacy was the evolution of Schwartz drugs. It was “modern” and larger but still kept the neighborhood drug store traditions. It had a soda fountain and was great if you could find a seat. A long magazine rack and rows of paperback books in swivel stands. The gift shop Mrs Schwartz managed was wonderful with interesting and fun novelty items you couldn’t find anywhere. As the saying goes, thanks for the memories and those were the good old days. I lived next store to the pharmacy on Haughton Drive right behind Islay’s ice cream store in the fifties. Too many great memories! I grew up in the old west end on Boston Place. Would walk to “Maxie’s” with my friends and loved the place. Gum balls and comic books. Later when I moved out of the neighborhood I became a Salter’s girl and then for many years an Ace Drug customer and loved Al Hirscg and his family. Sometimes went to Kenwood but Ace was closer. Loved reading all this. Great memories.